It’s not often that three comedic class acts come together to make a series that exceeds expectations with a concept so daring it seems like an impossibility, but it happens. And it’s even rarer that such a show makes it to the comedic death throes of Fox, but it happened, too. Saturday Night Live alum Will Forte created the series The Last Man on Earth, and he brought in The LEGO Movie and Clone High directors Phil Lord and Chris Miller to direct the pilot. If I had to live in a world without the Lord-Miller tag team, life wouldn't be worth living. Except for bacon and other stuff. 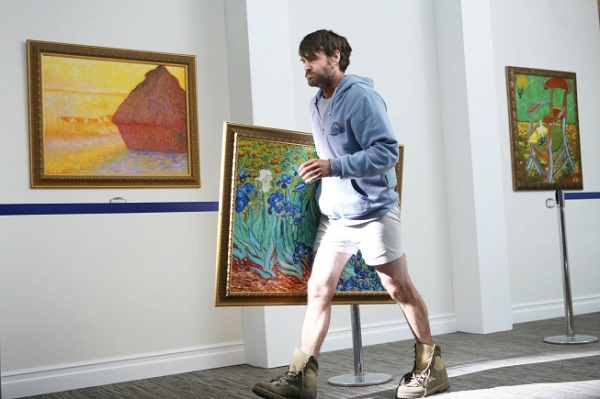 Like Seinfeld was a show about nothing, The Last Man on Earth is a show about no one. Or rather, no one else besides Phil Miller (Forte), an average family man and bank worker who wakes up one day in 2022 to find that he is literally the last person on Earth. He decides to travel the continent in his RV, looking for anyone else that might have been left behind after some mysterious occurrence. The press release lists a few “humorous” examples of the silver linings that planet-wide solitude can offer a person. You can go live in the White House if you want. You can park in handicapped spots without an ounce of guilt. You can decorate your home with priceless works of art. You wanna wear a pair of tighty-whiteys and nothing else every single day of the year? Not a problem. As we can tell from the images below, some of the fun of this series is going to center on Phil living out certain situations, dreams perhaps, that he couldn't have otherwise. I'm willing to bet he gets out a lot of frustration as well. If it doesn't feature a destructive fit inside of a department/grocery store, I'm going to pen a letter to someone important. Here's Phil possibly singing the National Anthem at a baseball field. Steeee-rike. Always wanted to steal some fine art from a museum? Phil did it. But is it still art, if there's no one else around to admire it? And here he is just walking around with his megaphone. I can't wait to see how this is employed. Why didn't this get a trailer, Fox? Will Phil Miller ever find anyone else to talk to? (Perhaps someone named Chris Lord, maybe?) Find out when The Last Man on Earth makes its road trip to TV in 2015. You can find the full Fox 2014-2015 schedule here.